During the contruction of what is now the District Line between Bayswater and Paddington stations, 23/24 Leinster Gardens had to be demolished as the new route passed directly under it. 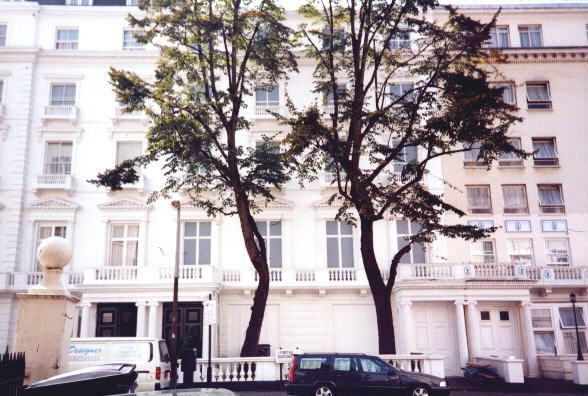 Rather than rebuild new houses, the railway company merely constructed a facade that matched those on either side. Looking at an aerial view on www.streetmap.co.uk, the empty space of 23/24 is visible as the blank gap between the white and green rooftops, roughly in the centre of the top-left quarter of the photograph. 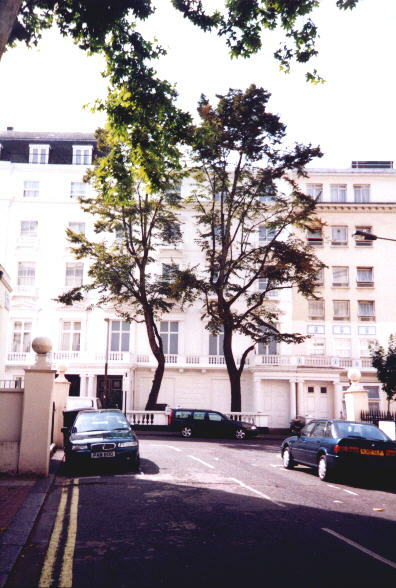 The facade faces onto the heavily tree-lined Craven Hill Gardens, under which the line runs before cutting beneath Craven Hill towards Paddington. At a passing glance, the conceit is fairly effective, but it is only on closer inspection that the blank painted-on windows and the absence of letter boxes on the two front doors gives the game away. Standing furthur back, other clues are the absence of any roof extension and the fact that the trees in front of the property have been allowed to grow unchecked compared to the houses on either side.